The Danes take cancer prevention and awareness to a new level. Props to The Danish Cancer Society and presumably one of their agencies who created this viral video. It has all the ingredients to engage viewers as well as providing a reasons to pass along. So, I left my favorite sneakers in the garage the other day. Actually, they ended up staying in there for a couple of days. I went to put them on yesterday and noticed a strange odor coming from the left shoe. I’m pretty sure the cat that’s been leaving paw prints on my car hood decided to leave its nasty scent on the left shoe. I bought these North Face sneakers at Sports Basement this evening. I’ve been putting up with this rogue cat leaving its paw prints on my freshly washed and waxed car for several months. This latest stunt by the feline intruder means war. Granted I needed a new pair of sneakers, I don’t need the cat marking my shoes and thus dictating the timing of my shoe purchases. This score is going to change. The cat my not know it but it will soon be relocated to the humane society or some other locale. Does anyone have a havaheart trap I can use for a few days? With a nod to Auggie Busch and his new bosses, last night at Monaghan’s our trivia team name was “This Bud’s for EU”, after trivia I heard that the Drudge Report used the same line – great minds think alike. At least for our This Bud’s for EU trivia team conquered all comers. Although I was a wee lass in the 80’s, I have vivid memories of the news stories about the Japanese buying up hallmark US properties, media companies and golf courses amidst that period of the dollar and economy being weak. But IMHO, A-B could have held off inBev, if they had only kept up with the market trends in their business of mass distribution. I don’t believe the weak dollar and the economy is fully to blame. For the past several years there has been been a lot of consolidation in the global brewing business. Take for example, Miller – that Champagne of beers. Miller, while HQ’d in Millwaukee Wisconson is owned by SAB Miller, the South African brew master of brands such as Grolsch, Peroni, Hoegaarden, Pilsner Urquell and everybody’s favorite – Olde English 800 Malt Liquor. Molsen bought Coors..and the list goes on. If A-B had flexed its muscle and cash reserves, they could have bought more beer brands and built a better defense. The soda business is much the same – just ask friendly folks at Coca-Cola. In these businesses where locked up distribution and globalized brands is everything, you either go big or go home. I’m less concerned about inBev making drastic changes to the A-B brands that people in the US and other countries love (for their Americana kitsch) and more concerned about the lack of having any US brewer with scale. A-B gobbled up many of the craft brewers years ago, so they are now part of inBev. Heck, even little north woods Leinenkugel up in Chippewa Falls, Wisconson is part of inBev. And being the self serving adman that I am – just thinking about the branding possibilities for that yet to be named brewer have me thirsting for some great ad work down the road. I wonder if DDB is thinking about this yet? In the meantime I’ll continue to have a Bud every once-in-a-while as well as a Stella. 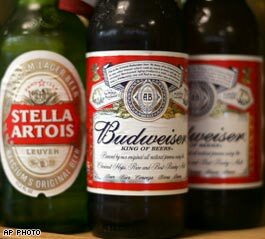 And BTW did you know that in the UK and Europe that Stella is commonly referred to as “wife beater“, as in you belly up to the bar and order a wife beater and you will without question get a Stella. I found this out while going to lunch in London a couple of years back. As part of this deal, I sure hope domestic violence won’t be on the rise. Who will become the last American brewer to step up the the plate and speak for American brewing? Anyone have thoughts/suggestions – I would love to hear from you. Spirit Airlines crazy?…like a fox?? The other day I noticed this ad and laughed. Either the creative knew exactly what he/she was doing or the are seriously out of touch with the world. WTF has long been shortcut for a well know phrase. Daring creatives and their advertisers, especially ones targeting the YAM audience, can get away with this and many do (e.g. Axe, McDonald’s, Old Spice, etc.) But the Spirit ad, marks the first I’ve seen in the typically conservative airline world. Granted, World Traveler Fares isn’t a stretch to but is this Crazy? Or crazy like a fox? A while back the McDonald’s creative team at Tribal DDB came up with something similar, aimed at the Dollar Menu audience – YA to be sure. The response certainly proved that we were connecting with our core audience and getting noticed. The ad went on to make it’s way into the blogoshphere and wikipedia and into a major newspaper cartoon strip, where it was parodied. The talk value and earned media, in my opinion, was a perfect fit with our audience and certainly gave the Dollar Menu “street cred” with the target. To this day, I take my hat off to our creatives for bringing this to the client and to our client for being an advocate for pushing the envelope. Like many of you, I saw the great outtake of the typically sanguine Bill O’Reilly going beserk on his crew for a teleprompter snafu. What you may not have seen is this producers cut of the snafu. Hey, Bill, take a deep breath and relax…this is the no spin zone. The world of politics and political reporting will miss Tony Snow. IMHO Tony brought excellent reporting and was one of the most straightforward White House Press Secretary’s we have and probably will see in a long time. What is a Thunder House? Benjamin Franklin designed the thunder house to showcase the effectiveness of his invention, the lightning rod. Without the lightning rod, tall buildings were in constant threat of being struck by lighting. Franklin used his thunder house to show the disastrous effect of lighting and demonstrate how using his lighting rods could save buildings and the people within them. In essence, the Thunder House was a place, an instrument really, for Dr. Franklin to showcase one of his greatest inventions as well as share knowledge about electricity. This Thunder House is a place to share ideas about topics I’m passionate about, engage with community and talk candidly to spark some great conversation.